Set oven to 425 °F. In mixing bowl combine flour and salt. Add butter and mix with beater until well blended. Add vegetable shortening; mix. Stir in water and egg and beat until well blended. The dough should stick together when held in your hand. Place mixture in a zip-top bag and refrigerate for 30 minutes. For the filling: In small saucepan over medium heat, melt butter and stir in the brown sugar. Heat until the sugar is dissolved into the butter. Stir in pumpkin and cinnamon. Stir over heat for 3 minutes. Remove from heat and place pumpkin mixture in refrigerator to cool off completely. Filling must be cooled. Lightly grease a large baking sheet. Take chilled pastry dough out of refrigerator and divide it in half. Return the remaining half to refrigerator. Divide dough you have into 6 balls. On a floured board or table, roll each ball into a circle with a rolling pin. Fill each circle with about 2 tablespoons cooled pumpkin filling. Fold one side of circle over and press down on the edges. You must press edges together to keep filling from running out. Take the remaining egg and put it into a small bowl, add 1 teaspoon of water and beat. With pastry brush, brush egg wash on top of each empanada. Place the first 6 empanadas on the baking sheet and bake for 15 minutes or until they are golden and the edges are lightly browned. Take the rest of the pastry dough out of the refrigerator and follow the same instructions. When you are finished, you should have 12 empanadas. You can use different filling for the empanadas if you wish. Pineapple, strawberry, and apple make good empanada fillings! Experiment and see which your family likes best. You can bake empanadas the day before you need them, then just warm them up in the oven when it’s time to eat them. Every family has different Christmas traditions. One of my family’s favorites is Pumpkin Empanadas on Christmas morning! I remember my own mother making empanadas for me and my brother. I always knew when she had put them in the oven, because the house smelled so good. I grew up eating Pan Dulce and I am passing my love of it on to my children. It is important to me that they grow up experiencing some of the same things that I did. 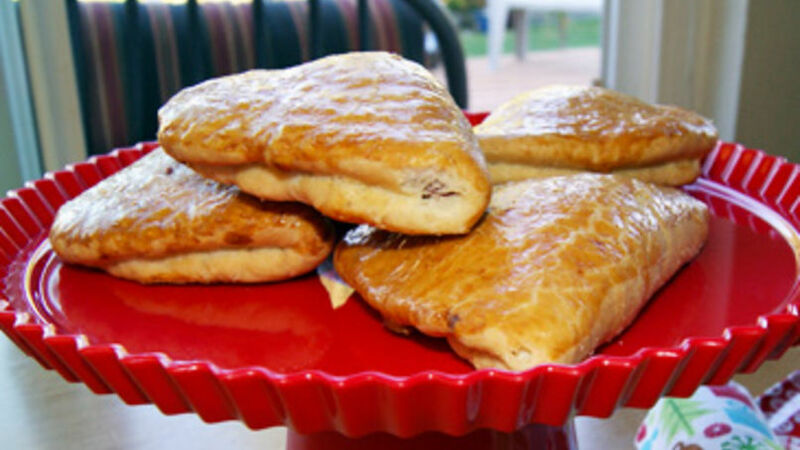 These Pumpkin Empanadas are easy to make and they taste delicious. What is your favorite bread or Pan Dulce to eat during the Christmas season? I’d love to hear about your family traditions!